We offer a whole suite of periodontal services ! Treatment methods vary and depend upon the type of disease and how far the condition has progressed. In all cases, the first step is usually a thorough cleaning that will include scaling and root planning to remove plaque and tartar deposits beneath the gum line. This will allow gum tissue to heal and reattach to the tooth. 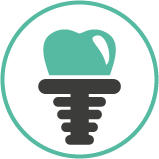 A Dental implant is a small man-made titanium screw that serves as the replacement for the root portion of a missing natural tooth. Periodontal procedures are available to lay the groundwork for restorative and cosmetic dentistry and/or to improve the health and esthetics of your smile. When recession of the gums occurs, the body loses a natural defense against both bacterial penetration and trauma. When gum recession is a problem, gum reconstruction using grafting techniques is an option. A frenum is a naturally occurring muscle attachment, normally seen between the front teeth (either upper or lower). It is normal to have a frenum, but it should not pull on the gum margin or recession could potentially occur. Despite our best efforts to save a tooth, sometimes extraction is the only alternative. Many factors can contribute to this, extensive trauma, decay, gum disease or badly cracked or broken teeth. A sinus lift or augmentation is a procedure that adds bone to your upper jaw in the area of your molars and premolar teeth. Teeth out of alignment? T-Scan to the rescue, let’s have Dr. Gandhi make a movie of your bite. Dental cone beam computed tomography (CBCT) is a special type of x-rays machine used in situations where regular dental x-rays are not sufficient. The CT scanner uses a special technology to generate three dimensional (3D) images of dental structures, soft tissue, nerve paths and bone in the craniofacial region in a single scan. Images obtained with cone beam CT allow more precise treatment planning.